There’s no way that you’ll be able to play games on a budget laptop... is there? Acer get our tests started with the Aspire 5115WLMi, an appealing silver-black system that comes packed with features: 2GB of RAM, 160GB hard drive, Wi-Fi, dual-layer DVD writer, USB, Fast Ethernet, VGA, Firewire, even a DVI port. It's an impressive list. You get some genuinely useful functionality in a variety of bundled utilities, too. Windows Vista Home Premium doesn't support EFS file encryption, for instance, so Acer includes a tool to do just that. Select your file in Explorer, click the Encrypt File button on the toolbar and the job's done. It's not all good news, however. The system is a little heavier than most at 3.7kg, and the integrated Web cam is only a low-resolution 0.3-megapixel model. Still, on balance the system offers plenty of features for your money. 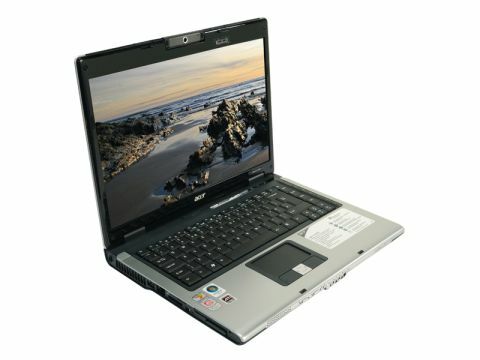 Acer has equipped the Aspire 5115WLMi with an AMD Turion 64 X2 TL-60 CPU, which means that you get snappy performance and excellent memory bandwidth. So it's a pity that it's also hobbled it with a lethargic 160GB hard drive, which came bottom of the list in our performance tests. Still, the system did surprisingly well in our benchmarks, returning a third place in PCMark Vantage. Even better, the integrated Radeon X1600 graphics managed a first place 1,317 in 3DMark 06. While slow by desktop standards, it's still powerful enough to play at least some games at an acceptable frame rate. You may not be playing these games for long, though, because the Aspire 5115WLMi had poor battery life under load: only 48 minutes. We like this system, but it's best when you don't wander too far from a power point.